Yesterday, YAF exposed Virginia Tech for threatening students who fail to complete a mandatory online diversity course with fines. Today, however, Virginia Tech appears to have quietly removed the policy from its website. 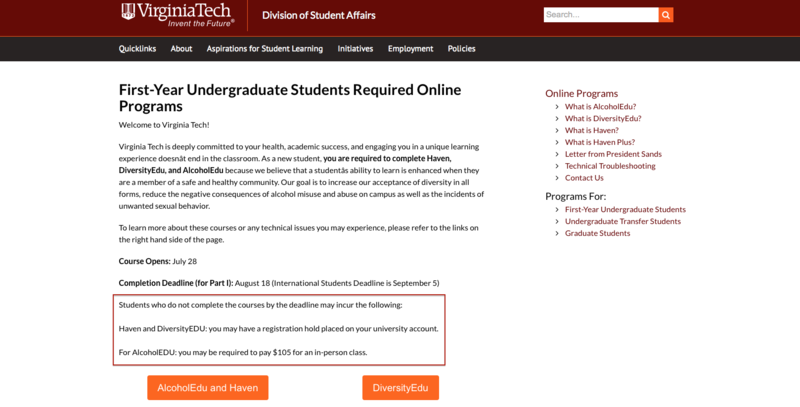 As of yesterday, Virginia Tech’s website indicated that students could face $105 fines and holds on their accounts for failing to complete a required online course packed with leftist teachings on race and gender called “DiversityEdu.” After publication, the language about the fees mysteriously disappeared from the site. According to Google’s cache of the page from Monday, it’s clear that the threat YAF reported on was firmly in place. As of Thursday morning, however, the page had been updated, no longer indicating the university would fine students for failing to complete DiversityEdu online. This is documented in both screenshots below. 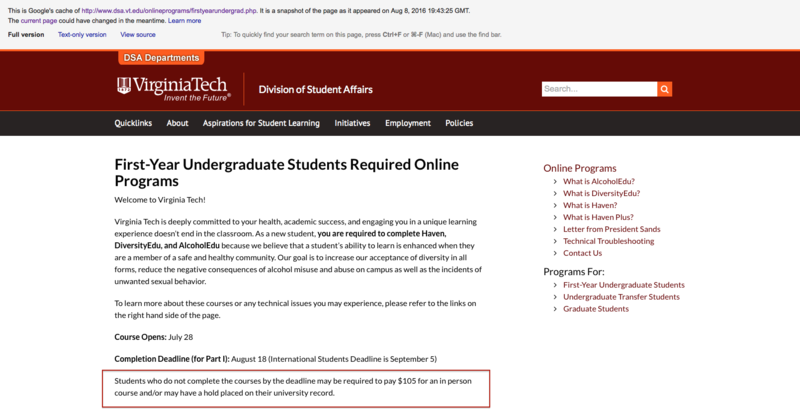 Here’s the page as it appears today, indicating only students who fail to complete AlcoholEdu online will face the $105 fee. Here’s the page as it appeared at the time the exposé was published, indicating the $105 fee would apply to students who failed to complete the DiversityEdu course, as well as the other courses. It’s interesting that Virginia Tech appears to have made this change only after receiving backlash motivated by YAF’s exposure of this ridiculous policy. At the time of publication, Virginia Tech had not returned YAF’s request to comment on the change. If the school eliminated the policy based on YAF’s exposure, it cannot be considered a victory for campus conservatives until Virginia Tech ceases to require that students endure the ideologically unbalanced DiversityEdu program altogether.